2015's stripped-back Death/Doom release by My Silent Wake gets a second outing with some bonus material. It's not that long ago that my colleague Kris provided some thorough coverage of this very album: but you may nonetheless be interested to know that it's just had a tidy re-release through the well-respected Italian Minotauro Records label. If nothing else, that should address the difficulties in actually buying a CD copy from previous issuing label House of Ashes. Early purchasers - and those who later missed the copies available direct from the band - faced what could, at best, be described as a somewhat idiosyncratic ordering process - I certainly remember struggling with it in a way totally alien to the slick and efficient Minotauro shopfront. Anyway, with this 2017 re-release, not only do you get to avoid web-cart purgatory, but you also get three bonus tracks thrown in. Granted, these are the original album tracks with some newly-recorded layers added on top - courtesy of Simon, from the recently-expanded five-piece line-up - but it would be a particularly churlish complainant who could find any fault with that. 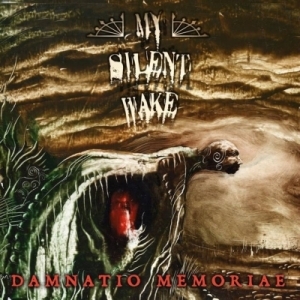 I'd view 'Damnatio Memoriae', in it's 2015 form, as something of a buttress within the MSW discography. Post-2010, and the release of 'IV Et Lux Perpetua', came something of a confusing period: lots of band changes and lots of releases, almost all in the form of compilations, splits, EPs/singles, reinterpretations and experiments - with the one new full-length Death/Doom venture 'Silver Under Midnight' being a swan-song of sorts for older line-ups. No disrespect to any of the work produced during this period, I hasten to add: I bought it all, and loved significant portions of it. But when 'Damnatio...' arrived, it was with a sense of concrete purpose and direction that reflected the rejuvenated permanent line-up. At that time it was a trio, with veteran founder member Ian Arkley joined by the highly experienced pair of Addam Westlake and Gareth Arlett. One of the great strengths, over the years, I've observed with MSW is an ability to adapt to the talents of whoever featured on their current roster: this is no exception. It's said "if all you have is lemons, then make lemonade": in similar fashion, perhaps, if all you have is a thunderously effective selection of bass, drums, guitar and rasping, world-weary vocals, then go ahead and make a vintage Death/Doom power trio album (that's not to overlook Ian's keyboards, and the guest vocals by longstanding friend Greg Chandler; consider it poetic license to keep the analogy a little more snappy). And that, really, is what 'Damnatio Memoriae' did: put together a storming selection of almighty heavy and potent modern-yet-vintage tracks, some of which are hectic and spleenful enough to point back as far as Ian's involvement with the intelligent, socially and morally aware Thrash of Seventh Angel (and, squaring an academic circle, one of SA's members was a certain Simon Bibby, now credited as part of the MSW 2017 line-up. Which might help explain how, on the bonus tracks of this release, it's possible to make a dulcimer - of all things! - sound like the harbinger of apocalypse. Something that, frankly, demands respect all of its own). Personally, I loved the wrath'n'rumble of the original album, which is presented as-was, with just a slightly-revised credits page in the booklet adorned with Juha Vourma's distinctive artwork. The additional tracks are a little more lush and full, with the extra instruments mainly occupying counterpoint spaces left by the guitar, and adding just a touch of typically MSW Gothic nuance. I wouldn't necessarily say that having them is - completionists excluded, of course - sufficient to re-purchase this if you already have a copy, but it's a nice touch to include them, regardless. So, although I'm going to stick to Kris's mark for the original stompingly-hefty venture, this is definitely the version to get, and I do have to recommend that - if you haven't already - you seriously consider investing in it...along with all the other many and varied flavours of Gothic/Death/Doom that MSW have produced over the years.